Does anyone know if Oakwood Daffodils is publishing a new list this year? If so, can some send me an email copy of the list? 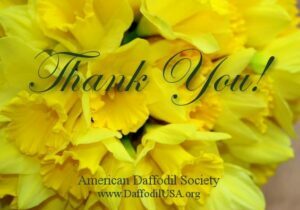 Oakwood’s 2019 bulb list is on the ADS listing of daffodil sources on its website. Good to see you at Peggy’s. May it be a good daffold season! Has NJ proved to better than NC? Jackie, that was a nice day at Peggy’s for our refresher at Brent and Beckys.